BuzzSumo is a tool that lets you find the most shared content and trending influencers. You can use it to analyze which content performs best for any topic and all you need to do to get started is to search for a topic or a domain. 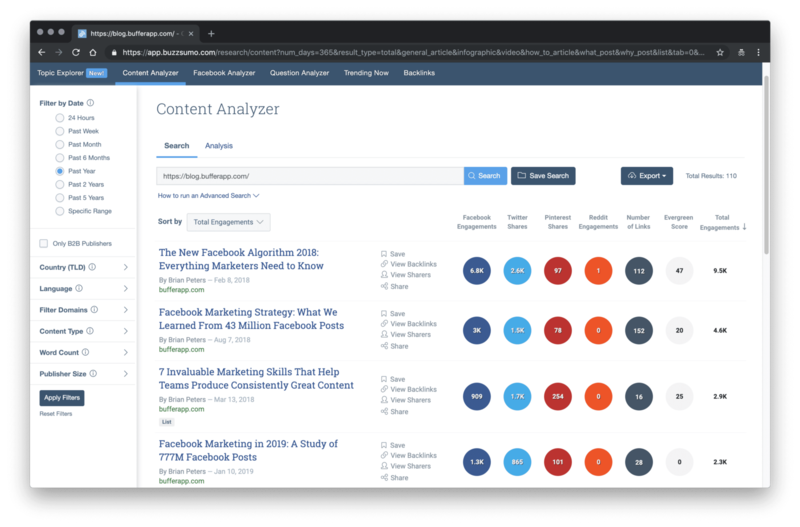 Through BuzzSumo you’re able all gather a better understanding of your impact on social media and develop smarter content strategies by seeing which of your own pages were engaged with the most. BuzzSumo will break the results down by Facebook, Twitter, Pinterest, and Reddit shares. This provides the added benefit of being able to see which articles are performing well across the web without having to constantly monitor multiple social channels. Google Trends is a completely free tool that Google created to help anyone search for trending topics online. Brands use it to monitor notable things that are happening in the world. Many professionals use this as a way to discover and share information related to what’s most popular right now. 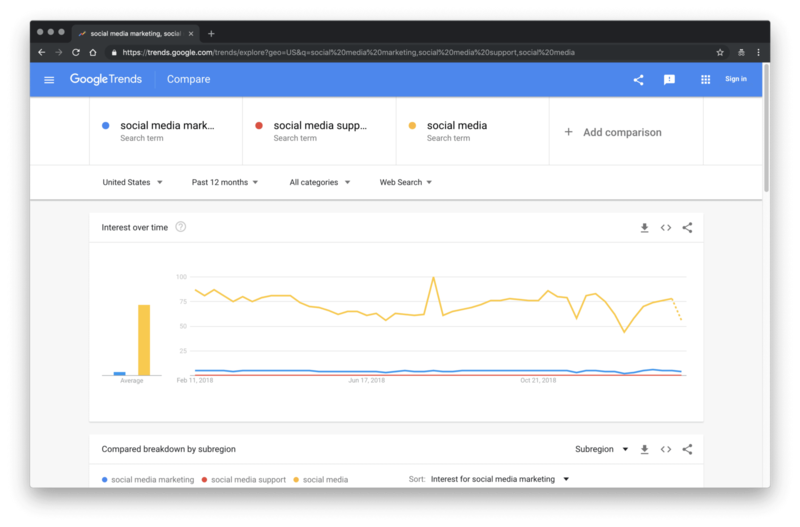 You can also use Google Trends to monitor keywords to see if they are trending and how their current volume compares to previous months and years. You can then use this information to inform your content and social media marketing strategy. 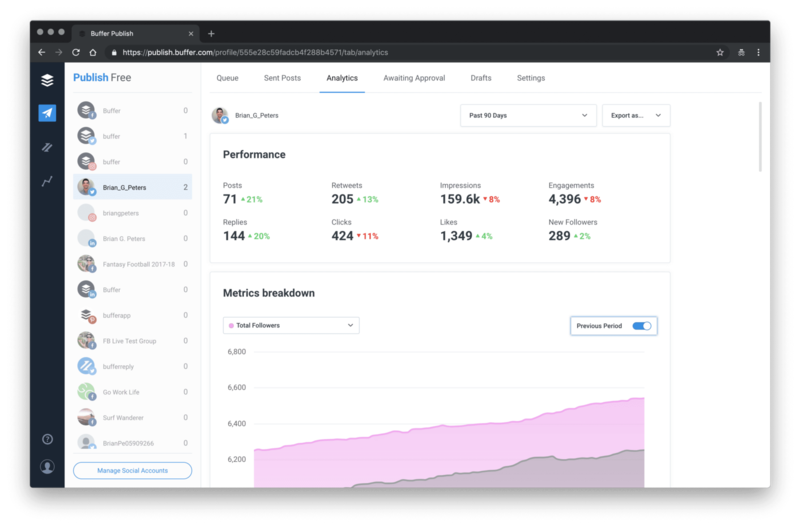 Buffer is a social media marketing platform designed to make it easy for businesses and marketing teams to schedule posts, analyze performance, and manage all their accounts in one place. For example, Buffer allows you to set up a schedule for your social media profiles, and after you add content to your Buffer queue, it will publish at the times you’ve designated. 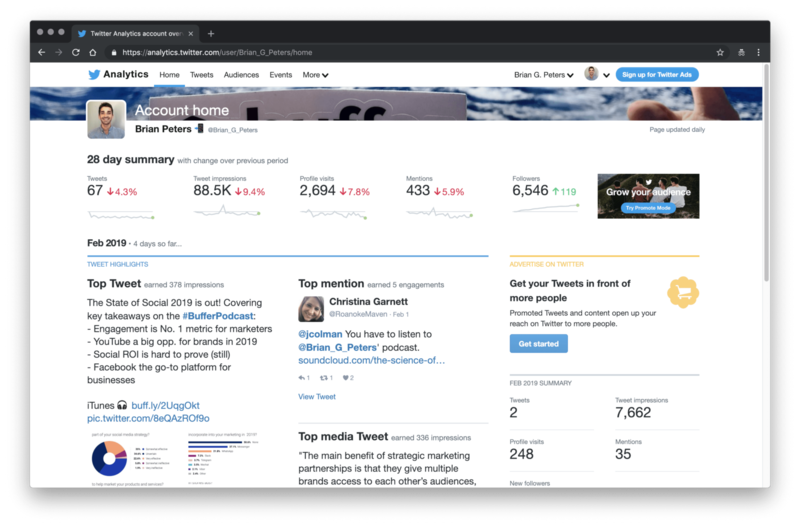 Buffer also provides a robust analytics dashboard so that you can see which of your posts are most popular on social media, and easily Rebuffer them to your queue. In addition to our web application, we also have both Android and iOS apps as well as a fantastic Chrome Extension that’s great for Buffering while you’re browsing the web or on the go. Another fantastic tool that absolutely every brand or business online should know about is Canva. Many times social media managers and marketers need to be able to create beautiful images without a designer. It’s what makes up part of a great social media strategy. Canva is the tool so many marketers rely on for making great-looking social media images quickly. You can use the ready-made templates, icons, and illustrations to make your images look professional without having to do much of the actual design work. 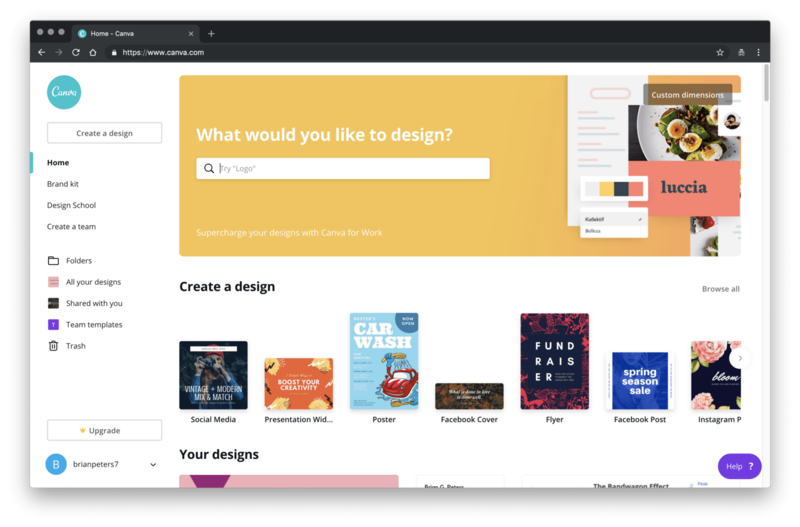 Canva has an easy to use drag-and-drop interface plus a massive library of over two million graphic elements. One of our favorite tools in the design, photography, and video space is Unsplash. Unsplash is a massive library of free professional photos you can use — free! 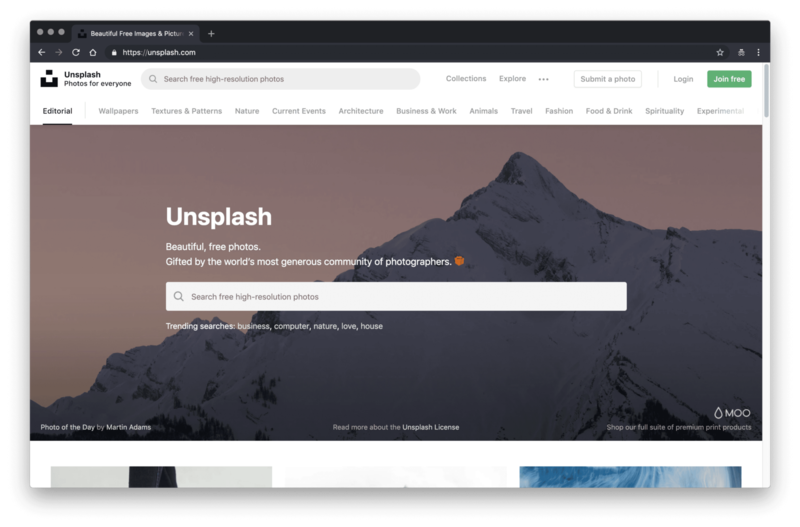 Unsplash photos are really popular with many social media marketers because they can help give your content a professional, polished look. And there are so many Unsplash collections to explore. We recommend finding a couple of creators whose photos you really enjoy and following them so you can always find their latest work. Animoto is one of our go-to social media tools for quickly creating stunning marketing videos. Their video maker turns your photos and video clips into professional content in just a few minutes. They describe it as “fast and shockingly simple,” — and we would agree with that. There are so many benefits to being able to quickly create engaging marketing videos. Video is a content format that we know a lot of people struggle with, but Animoto helps to bridge that gap. 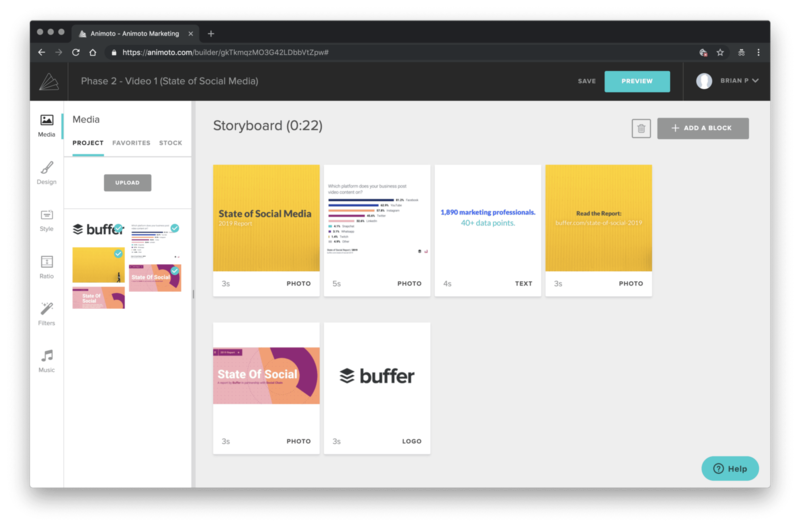 We’ve used it to create quick recaps of recent blog posts for social media, videos promoting a big announcement, and videos around product launches. Using Animoto, there are plenty of opportunities for you to add value to your audiences’ lives. 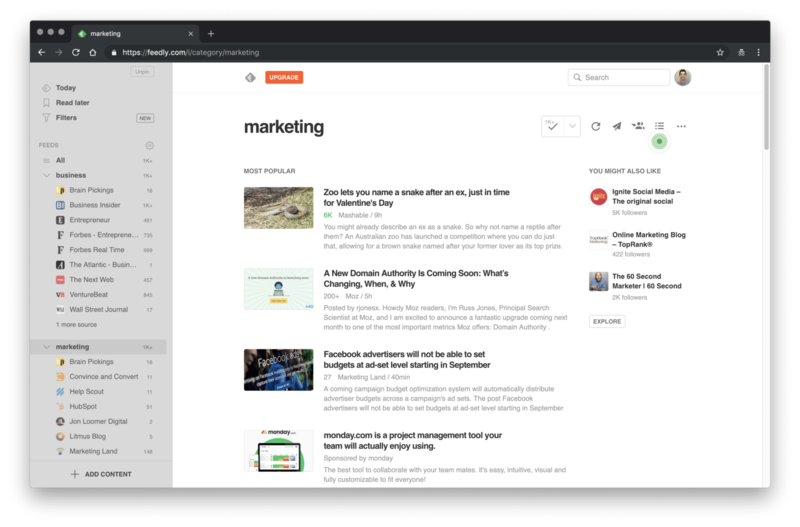 Our next tool is Feedly. Feedly is great for so many things. 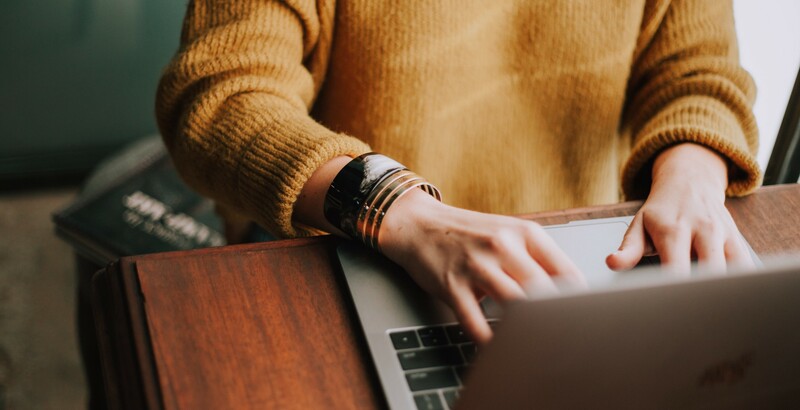 Maybe you work with influencers and want to follow their blogs, or you need to keep up on industry news, or any other reasons that you might visit several websites. Instead, you can add all those RSS feeds to Feedly and see them there. A huge time saver. Feedly is also great for content ideation. You can add several of the blogs, writers, and publishers whose content you like to one feed and see them in one glimpse. It even has a Buffer Publish integration so you can schedule your content to go out right from the Feedly dashboard. We also want to give Flipboard a quick shoutout here, too. While it’s not an RSS aggregator like Feedly, you can follow topics on Flipboard and it curates the world’s news stories to help you stay informed. We’ve used Feedly to follow specific influencers and industry news, and Flipboard to keep up to date with bigger stories. This next tool is one of our very own at Buffer: Reply. I think we’ve mentioned it a few times on the show but we’ve never gone too deep. 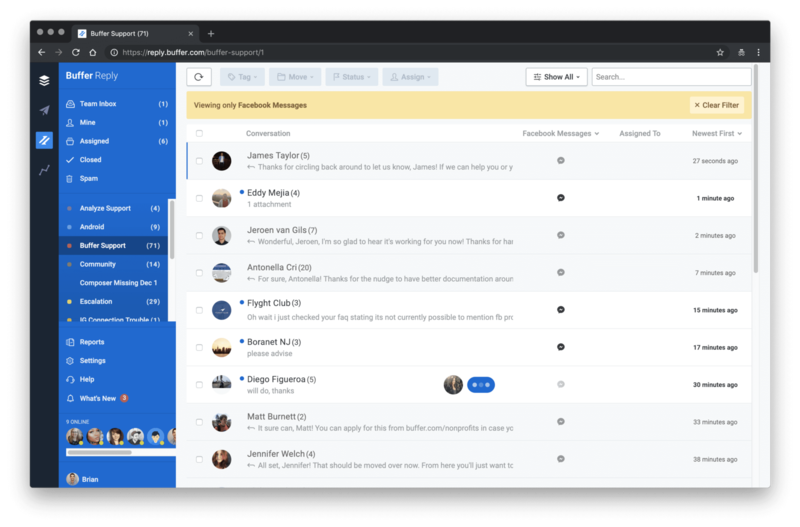 Buffer Reply makes social media engagement easy for marketing and support teams who need to respond to social conversations. It’s all in one inbox. On Twitter, you can see public tweets that @ mention your handle, direct messages, and any searches you have set up for keywords or hashtags. On Facebook, you can see comments on your Facebook Page posts and ads, visitor posts, private messages, and reviews. And for Instagram business profiles, you can see comments on your posts and ads as well. It’s a single inbox where you can see all of these conversations happening. It’s a huge time saver. In our case, our customer support team and social media manager, Bonnie, spend a lot of time in Reply every day, and we know that when someone reaches out, they would be getting an answer from us. We would be remiss if we didn’t mention native analytics for each social platform, which is completely free. Let’s quickly go over the top three, Facebook, Instagram, and Twitter. Under the Insights tab on your Facebook Page, there is just so much information. 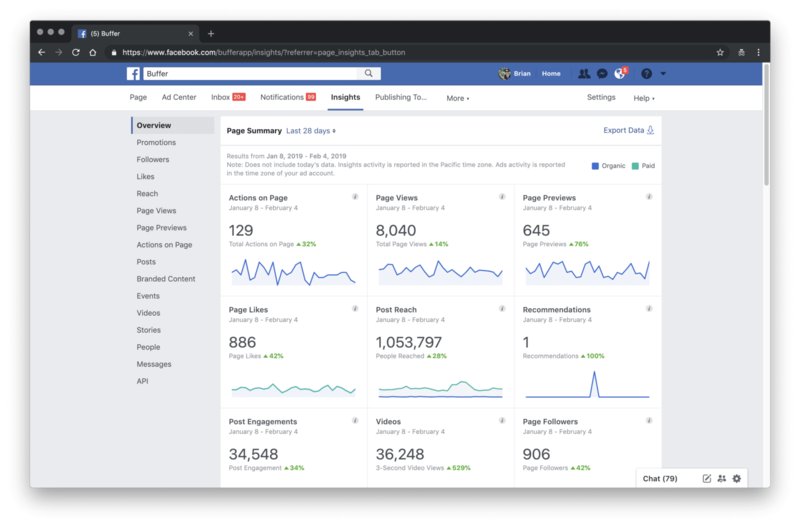 Everything you ever wanted to know about your engagement, number of likes and followers, how your posts are doing, and, of course, Facebook’s Pages to Watch which lets you compare the performance of your Page and posts with similar Pages on Facebook. You also get insights for Facebook Groups so if you run a Group definitely check those out. 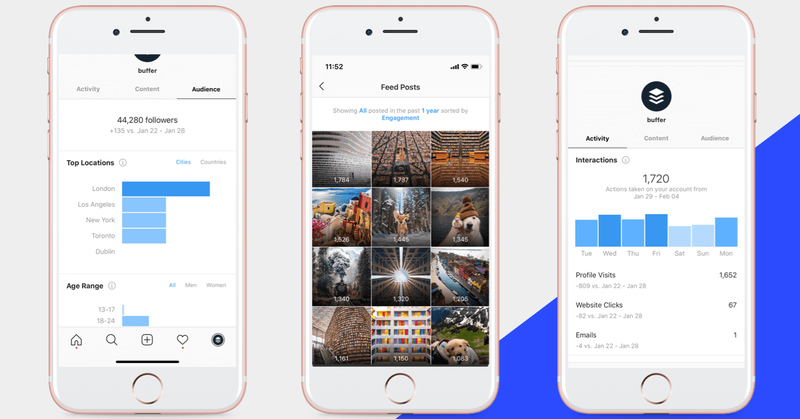 With Instagram Insights, you can see activity around how frequently users interact with your posts, see how your posts are performing over time, and find out where your audience is from as well as their age range, gender, and when they are online. Starting with Twitter, their analytics can reveal a lot of valuable data about your audience, how well you’re engaging your following, and what your top performing content is. All you have to do is go to analytics.twitter.com to log in and start learning more about your audience and their interests. The last tool we want to mention today is related to your productivity as someone managing social media: Todoist. 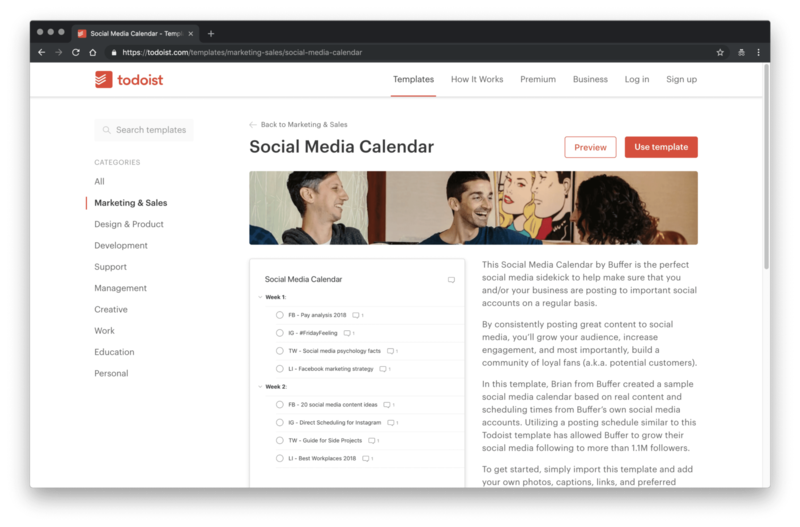 Specifically, within Todoist, I have created a free Social Media Calendar by Buffer that you can use to make sure that your brand and business are posting to important social accounts on a regular basis. This type of calendar is important because, by consistently posting great content, you’ll be able to grow your audience, increase engagement, and build a community online. This sample social media calendar is based on real content and scheduling times from Buffer’s own social media accounts. Although we couldn’t cover all of our favorite social media tools in this episode, we wanted to share some more of our favorites! This article was first published on the Buffer Resources Hub on February 11, 2019.